This chamfer and drill jig is manufactured from a recycled aluminum connecting rod. A common rod pin size is .180 with a .1875 drill being used for the bearing. If the bearing is perfectly centered, the clearance between the two is .00375. I found through checking numerous sets of rods from various manufacturers the pin location varied up to .005. 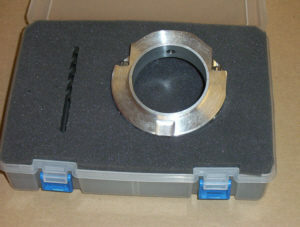 In these cases the pin would “bias” the location of the bearing rather than locating on the bearing tang as intended. To correct for this possibility I have installed a #10 drill bushing (.1935) in the jig. If your rods utilize pins that are not .180 let me know what size you have and I will supply the appropriate size drill bushing and drill. All drill bushings and drills “Made in USA”. Complete instructions included along with all the appropriate safety warnings.